KATHMANDU, March 10: The sudden change in weather due to the influence of westerly wind is likely to bring rain showers in various regions of the country on Friday, according to Meteorological Forecasting Division (MFD). The western disturbance will have widespread impacts mostly on the western belt. 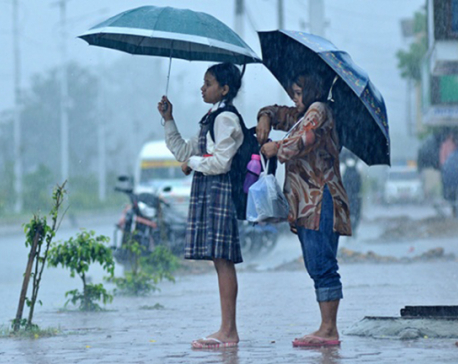 However, mid-western and eastern regions will also experience drastic weather changes, informed Min Kumar Aryal, meteorologist at the Meteorological Forecasting Division (MFD) of the Department Of Hydrology and Meteorology. “Although the disturbance has been observed since Wednesday, it will have widespread impact mostly on Friday. Affected areas will experience cloudy weather, rainfalls and even snowfalls,” he said. Even the Kathmandu Valley has been affected by the disturbance. The valley witnessed significantly cloudy weather on Wednesday with slight dip in temperature. MFD informed that some places in the Valley could have mid-level rainfalls on Friday. Likewise, MFD said higher Himalayan belt of the western region has higher chances of snowfall due to the weather disturbance. Republica district correspondents reported that at least 11 Village Development Committees (VDCs) located in high-altitude northern parts of Bajura district received snowfall. According to meteorologist Aryal, the weather will start improving from Saturday.